ON Sunday I witnessed what I describe as True Grit. I saw Ben Dyer turn up with the fire in his gut and grit in his teeth, something I havent seen for a long time, and take out the Open event over Danny Lee in miserable conditions. 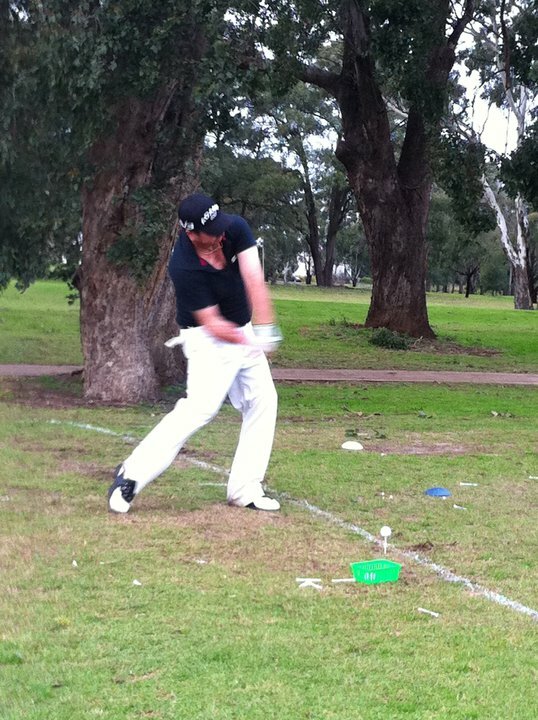 Congrats Benny a fabulous effort in the conditions to hit it 305.4 (30kph gusting head wind). We could tell it meant a lot to you if not everything. Other winners Richmond Saturday - Open Moylan over Bylsma. Brennan took out both events in Seniors. Two of the hardest days of competition (weather wise) I have had to endure. Ben was very focussed and got the job done. I am very proud of him. Both his parents were there and my parents had arrived from goulburn to see his win! I got a really good photo of him, but there is 1 issue...we can't find the club!!! That pic is awesome. Maybe we could have a competition to see who can guess where the head is. That win was a long time coming, but the best thing is we could see it coming. I think he may have 1 or 2 left in him this year. It was just great to see.